As promised, here are some practical tips for styling a mantel, and I’ve included inspiration boards to illustrate a few possible suggestions which can be adapted for your particular style and colors. The inspiration boards each have links to the items shown (in the text at the bottom of each board) in case you are curious about where to find some of the elements. 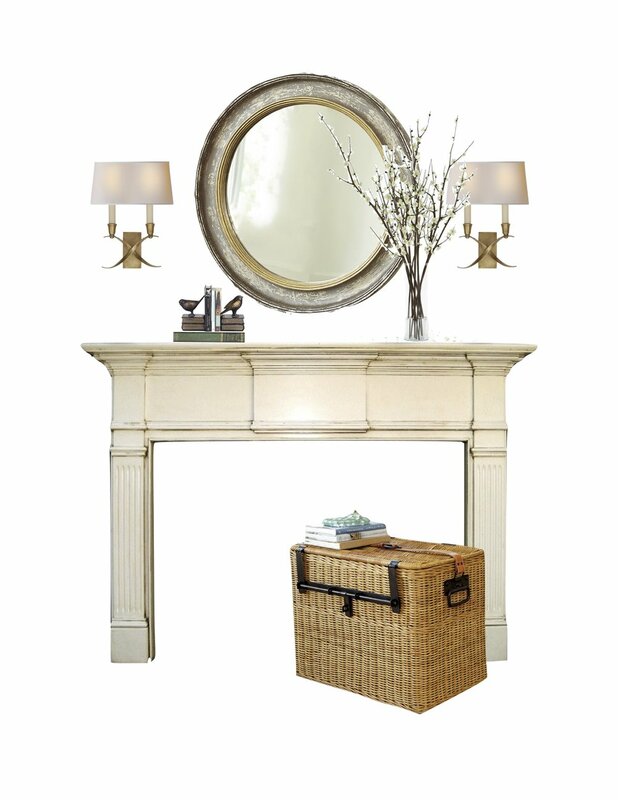 If you missed the post on adding charm with a fireplace, you can find that HERE. There are an endless variety of ways to style a mantel, but they all fall into 2 main categories: symmetrical and asymmetrical, or balanced. As is true in all elements in design from furniture arrangements to wall galleries to tabletop and mantel styling, strictly symmetrical arrangements are, in general, more formal and more static than asymmetrical arrangements. My personal preference is almost always for asymmetrical, balanced arrangements and they are a bit trickier to achieve, so I have included more examples of those. Symmetry is simply a mirror image arrangement of objects in a space - if you draw a line down the center everything on one side would have an identical, mirror image corresponding item on the other side. Symmetry can be restful (or boring, depending on your point of view) since it is so obviously balanced and you don’t have to work very hard to comprehend the arrangement. It also gives an impression of formality simply because it is so structured, but the elements themselves can be more casual to counteract that a bit. In the example below, a pair of sconces, and a pair of identical plates on stands flank a central grid of framed botanicals and a box in the center of a mantel, while a pair of identical stools rests in front of the fireplace. This symmetrical mantel arrangement works in this very formal dining room. The symmetry continues along the wall with matching pairs of painted cabinets topped with floral arrangements in front of gilded mirrors on either side of the fireplace. The dining table holds another symmetrical arrangement with an antique silver epergne flanked by candelabra. And here is another beautiful symmetrical arrangement by Tina at The Enchanted Home with blue porcelain jars, figurines, and vases of branches and flowers in front of a large landscape painting over an elegant stone mantel. Asymmetrical arrangements are more dynamic, and balance is achieved by balancing the visual weight of differing objects by placement and volume - much like you would balance disparate items on the opposite sides of a seesaw with heavier objects either closer to the center or balanced by multiple lighter/smaller objects. Things left slightly out of balance are more exciting (and therefore more dynamic) and things greatly out of balance veer into unsettling. A mix of symmetrical and asymmetrical elements is usually the best way to get both an orderly and interesting arrangement. The example below contains a symmetrical arrangement of sconces and mirror, and an asymmetrical arrangement of a vase of airy branches balanced by a more dense but smaller group of books and bookends. This next example contains a pair of sconces flanking a painting. Another piece of artwork overlaps it on one side and a decorative glass vase with a branch the other. The overlapping artwork is visually a bit heavier so is pushed closer toward the center than the vase. The living room mantel (shown below) in the home of Mark D. Sikes is a wonderful case study in casual elegance. The asymmetry of the leaning overlapping art and objects is grounded by the symmetry of flanking pairs of hurricane lanterns and cache pots. The whole scheme is neutral and the black touches are strategically spread over the mantel to create a pleasing rhythm. This example is nearly symmetrical with a pair of ivy plants flanking a mirror. A balance of different blue porcelains adds a bit of interest. And this one has symmetry in the center artwork and planter. The asymmetry is achieved with the trio of candlesticks of differing heights with the two shorter ones balanced by a taller one. This one has a symmetrical arrangement of mirror, sconces, and plates. And again, an asymmetrical arrangement of blue and white porcelains. Proportion, scale, color, and placement are such important tools in developing a pleasing arrangement. These are just a few guidelines that will be a helpful start in analyzing why you might find a particular arrangement pleasing. Analyzing images that you like and then experimenting with your own objects is the best way to find the balance that is most comfortable and appealing to you. Pinterest is a wonderful source of images to study - you can follow our Pinterest boards HERE.